Malachi Nichols presents data at the charassein conference. Malachi Nichols originally wanted to be an engineer. He came to the University of Arkansas from Midland, Texas, on a scholarship designed to recruit students underrepresented in the field of engineering, and he earned his bachelor’s degree in 2015. But, along the way, he taught a robotics class at Prism Education Center, a local Christian, private school, and he discovered what he really wanted to do was work in the education field – but not as a teacher. Nichols found his home in the education policy graduate program offered by the Department of Education Reform in the College of Education and Health Professions. More specifically, he discovered a field of research that fascinated him and, as he begins his third year in the program, he is already contributing data to the field. Nichols was one of several presenters at a workshop on the U of A campus last month presented by Charassein, the Character Assessment Initiative established by Gema Zamarro, who holds the Twenty-First Century Chair in Teacher Quality. In Greek, charassein means to engrave, scratch or etch and is the root of the English word character. Zamarro and her research fellows – who include faculty, staff and graduate students – are conducting research to improve measures of character skills, also referred to as non-cognitive skills, and to gain a better understanding of how character skills are developed. 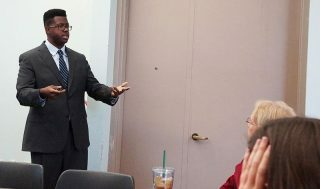 Nichols spoke to an audience that included graduates of the education policy program who continue to work with Zamarro and others in the initiative from their posts at Harvard University and Southern Illinois University School of Medicine. Like many other educators, Nichols believes that it takes more than good grades and test scores to be successful in college, a career and life. But, research is needed, not only to quantify the basis for that belief, but also to use the information to design programs that can help students improve or develop skills – conscientiousness, grit, perseverance, growth mindset, extraversion, openness and locus of control – they will need to get them through. In his presentation titled “College Readiness and Student Success: The Role of Non-cognitive Skills,” Nichols described data from research he conducted with Zamarro and Julie Trivitt, a clinical associate professor of economics in the Sam M. Walton College of Business. He helped analyze data from surveys administered to freshman students in the College of Engineering and the business school. The surveys aimed to determine which character traits are relevant to college success as well as how students’ subjective expectations of success in college affect their actual outcomes. He presented the data during the two-day workshop, and Eric Specking, director of undergraduate recruitment for the College of Engineering, led a discussion following his presentation. Suzanne McCray, vice provost for enrollment services, also joined in the discussion. The first takeaway from the research, according to Nichols, was that possessing the character traits of conscientiousness and grit is important for students to perform well in college. Further, students who underperform are those with the greatest amount of unrealistic expectations of their college performance, he said. Nichols described the general theme of his dissertation as the importance of non-cognitive character skills related to success in college. He plans to conduct further research on at least two more ideas: the role a lack of character skills plays when someone cites cost as a reason for not going to college or not graduating, and what role having groups around you who support your academic pursuits has compared to character skills. Nichols comes to the study of character skills from a biblical background, and he believes in the values-based educational model used at Prism Education Center. But, the information gained from a study of non-cognitive skills should not be limited to use in any specific religious system, he said. Other research projects conducted by the charassein researchers include how non-cognitive skills affect standardized test performance, international differences in student non-cognitive skills, and the effect of incentives and school organizational factors.